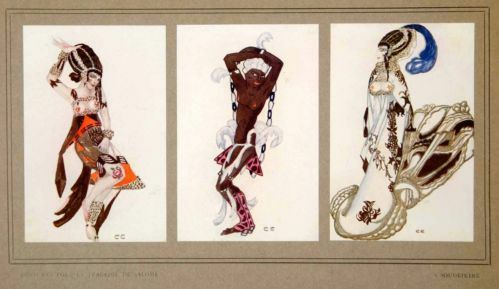 Costume designs for the 1913 Ballets Russes production of Florent Schmitt’s La Tragédie de Salomé, created by Serge Soudeikine. The ballet La Tragédie de Salomé, Op. 50 is Florent Schmitt’s most famous and oft-recorded composition — and it isn’t hard to figure out why. 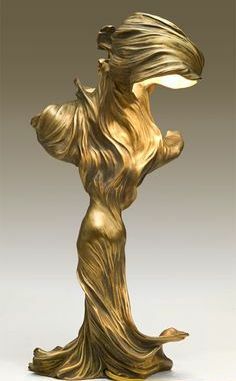 All the rage: A Loïe Fuller lamp, created and sold at about the time of Fuller’s 1907 premiere of Florent Schmitt’s La Tragédie de Salomé in Paris. Salomé represents the very best in the French tradition of evocative music on exotic subjects … but in this case, we have a hefty dose of the “epic” and “barbaric” to go along with the Impressionistic and “orientalist” touches. Composed in 1907 for chamber-size orchestra, the ballet started out nearly one hour long. 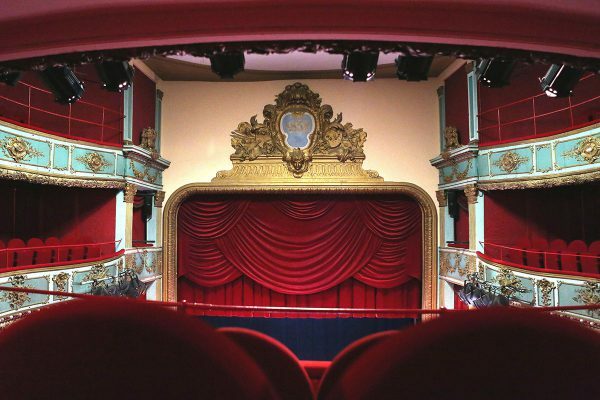 Its first performance was at the Théâtre des Arts (now the Théâtre Hébertot) in a production that featured Loïe Fuller, the American-born dancer and choreographer who was famous for her scarves and lighting effects. 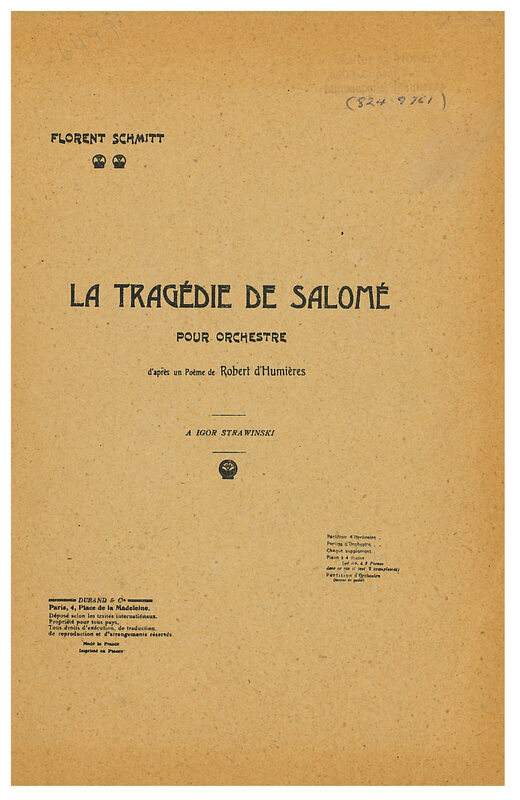 The program cover for the original production of La Tragédie de Salomé, presented at the Théâtre des Arts. Several years later, Schmitt revisited the score, condensing it to about one-half its original length while substantially augmenting the orchestration and adding optional female voices. 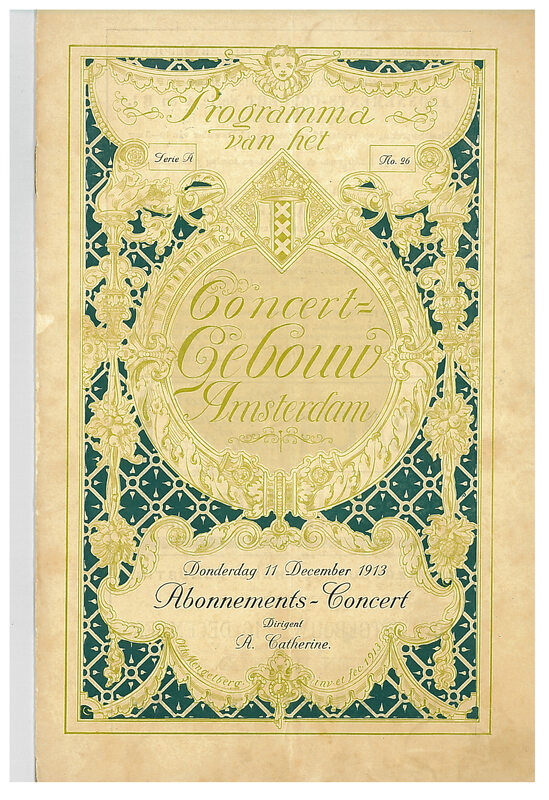 The resulting score, premiered in 1911 as an orchestral suite and featuring composer-conductor Gabriel Pierné directing the Colonne Concerts Orchestra, was a sonic spectacular. 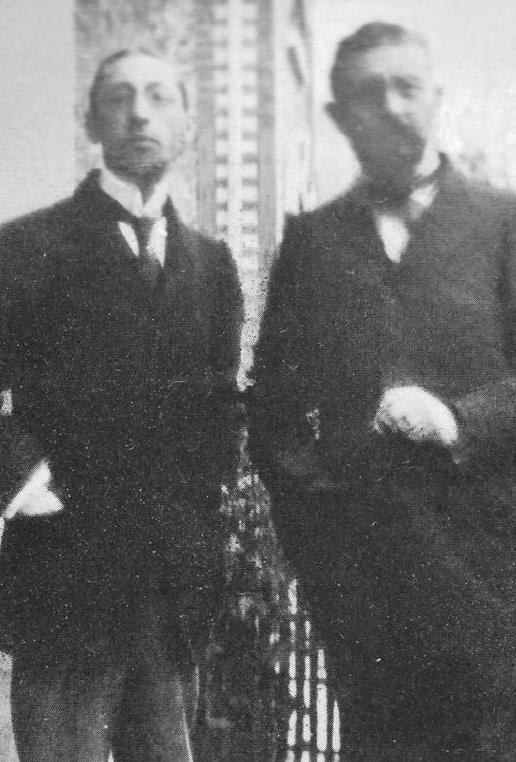 Igor Stravinsky (l.), photographed with Florent Schmitt about the time of the composition of Salomé. Schmitt dedicated the score to him. Schmitt dedicated his composition to Igor Stravinsky, who is said to have been influenced by the jagged rhythms and barbarism in certain parts of the score. 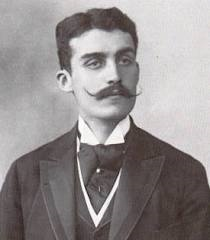 A noteworthy stage and literary career cut short by the First World War: Robert d’Humières (1868-1915). “Florent Schmitt has depicted this lurid scenario in music of unexampled vividness — of exotic imagination. 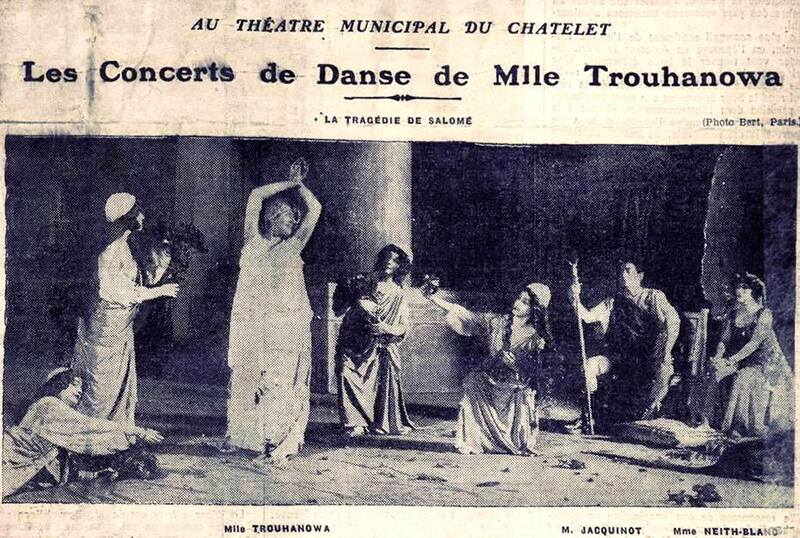 A newspaper clipping from the 1912 Trouhanova production of Florent Schmitt’s La Tragédie de Salomé in the composer’s new version — half the music, twice the musicians. Prelude — A terrace of Herod’s palace overlooking the Dead Sea. The pink and reddish Moab Mountains shut in the horizon. Dominating the scene is massive Mount Nebo, from which Moses, on the threshold of the Promised Land, greeted Canaan before his death. The sun is setting. John the Baptist crosses the terrace and disappears. Danse des perles (Pearl Dance) — Torches illuminate the scene. Their light draws sparking reflections from the clothing and jewels that spill out of a precious coffer. Herodias [Salome’s mother], in a thoughtful mood, dips her hands into the coffer and removes necklaces and silken veils of gold. Salome appears and leans over the chest in fascination. She puts on the necklaces and veils, and begins to dance with childish glee. Desire Inghelbrecht conducted the orchestral forces at the 1907 premiere of Florent Schmitt’s La Tragedie de Salome. Maestro Inghelbrecht would conduct this music often in subsequent years, including an ORTF memorial concert in honor of Schmitt presented in October 1958 following the composer’s death. This billboard announces a 1920 performance. The interior of the Théâtre des Arts (now known as the Théâtre Hébertot), where Florent Schmitt’s ballet was first mounted in 1907. Danse des éclairs (Dance of Lighting) — Darkness envelops the scene, and flashes of lightning provide the only source of illumination. In the wanton dance that follows, Herod pursues Salome, seizes her and tears off her veils. Salome is naked — but only for an instant. John the Baptist quickly appears and covers her body with his anchorite’s robe. Herod is furious and orders John to be delivered to the executioner, who takes the prophet offstage and returns later with his severed head on a brass charger. Salome triumphantly grasps the trophy and begins to dance. Then, imagining that the voice of the prophet is whispering in her ear, she runs to the terrace’s edge and hurls the charger over the battlements into the sea. The water immediately turns blood-red, terror grips everyone, and Salome collapses. Salome recovers, but the head appears, stares at Salome, and vanishes. From another position, the head reappears. Salome tries to escape, but the heads multiply, springing up from all sides. 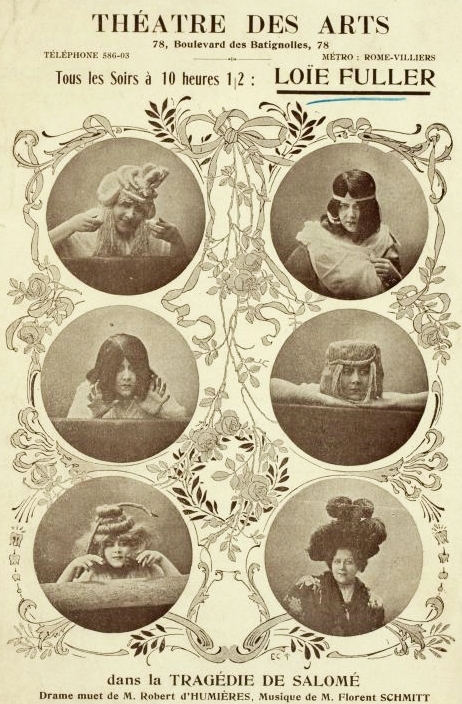 Salome covers her face in an attempt to blot out the grisly apparition. Danse de l’effroi (Dance of Fright) — A storm breaks out. Raging winds envelop Salome as sulfurous clouds float out of the abyss. A tempest rocks the sea and agitates the lonely deserts, while lofty cypresses twist convulsively in the wind and crash to earth. Lightning bolts shake loose the stones of the citadel, Mount Nebo shoots forth flames, the entire Moab Mountain range takes fire — and Salome, swept away an infernal excitement, is crushed in the onslaught of the elements. Brilliant together: Paul Dukas’ La Péri and Florent Schmitt’s Salomé shared billing on the same ballet program in 1912. 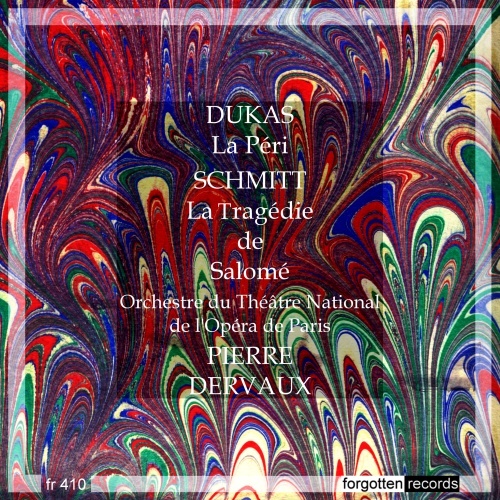 Today, while Salomé is performed mainly in the concert hall as a symphonic suite in the tradition of Nikolai Rimsky-Korsakov’s Scheherezade, one of the most memorable events in the annals of dance occurred in Paris in 1912 when a quartet of ballets was staged in a single evening: Paul Dukas’ La Péri … Vincent d’Indy’s Istar … Maurice Ravel’s Valses Nobles et Sentimentales … and Florent Schmitt’s Salomé. Each composer conducted his own stage work, leading the Lamoureux Orchestra. 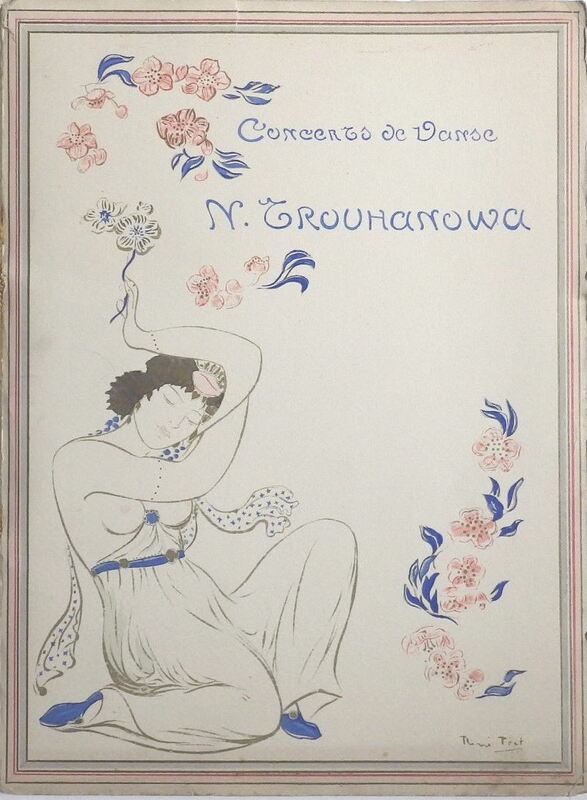 Cover of the 1912 dance programme featuring Natalia Trouhanova in four starring femme-fatale roles: Istar, Péri, Adelaïde (Valses nobles et sentimentales) … and Salomé. The last Parisian stage production of the ballet happened in 1954 at the Palais Garnier — a Paris Opéra production featuring choreography by Albert Aveline. Lycette Darsonval starred in the title role and the orchestra was conducted by Robert Blot. France may not have seen any recent revivals of the ballet, but in the past several years the Mariinsky Ballet has revived La Tragédie de Salomé as a theatre piece — to my knowledge, one of just three times the ballet has been presented on stage anywhere in more than half a century. Despite the dearth of stage productions, Schmitt’s music has never lost its popularity in France. Moreover, it has been brought to the far corners of the world by a surprisingly diverse group of conductors. 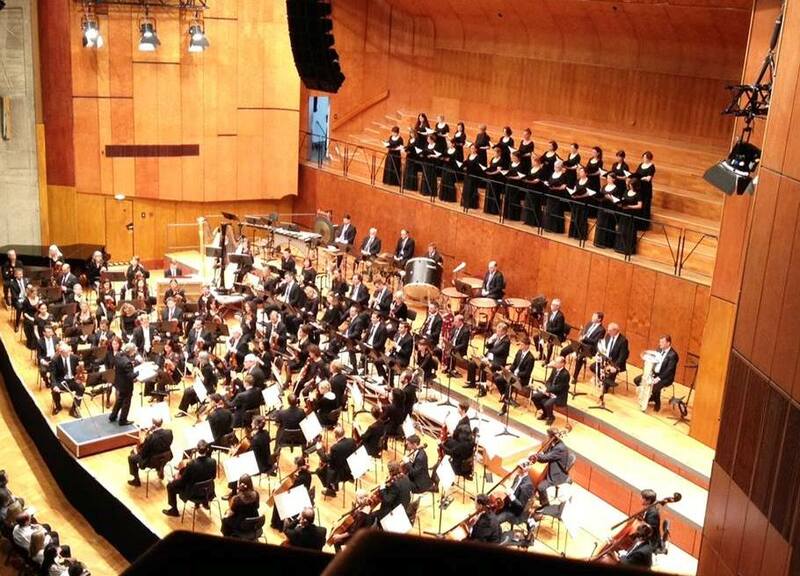 The first performance in America was presented by Karl Muck and the New York Philharmonic Orchestra in January 2014. And taking one orchestra alone — the Boston Symphony — the piece has been presented there by Pierre Monteux (in 1919), Serge Koussevitzky, Karl Muck and Dmitri Mitropoulos. 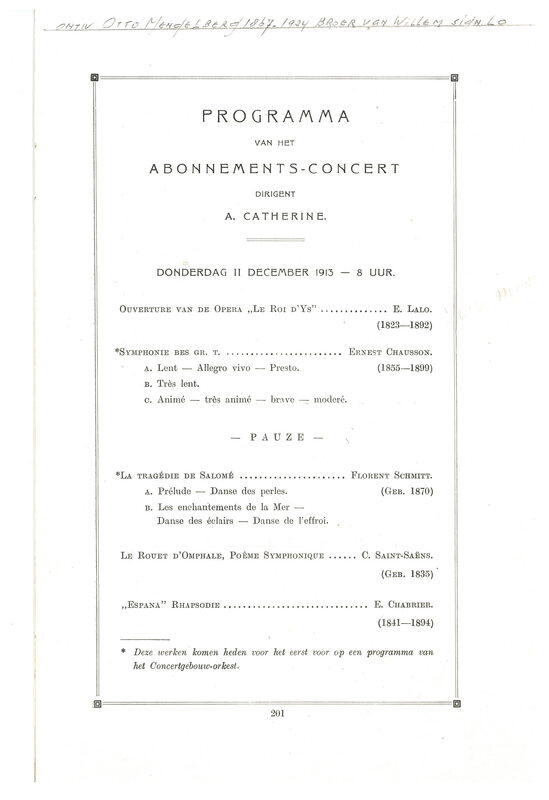 The first performance of La Tragédie de Salomé outside of France was with the Concertgebouw Orchestra of Amsterdam in 1913. 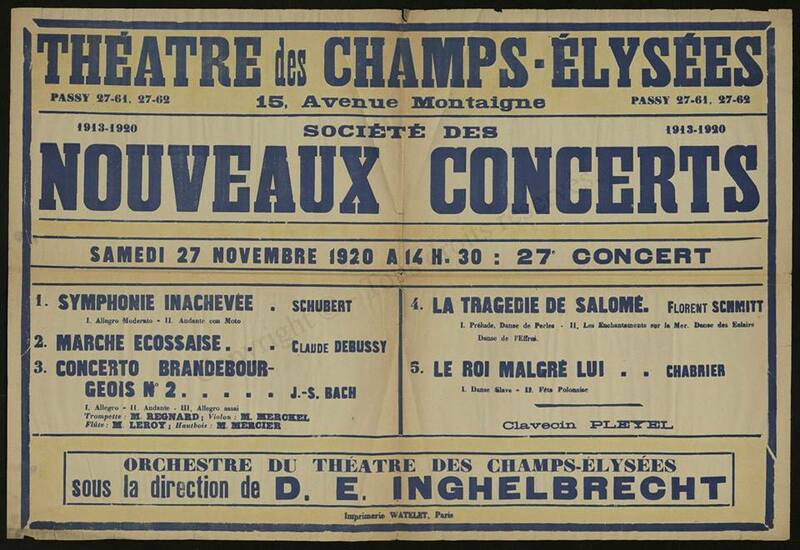 The 1913 concert performance of Schmitt’s La Tragédie de Salomé with the Concertgebouw Orchestra shared billing with Ernest Chausson’s Symphony in B-Flat. 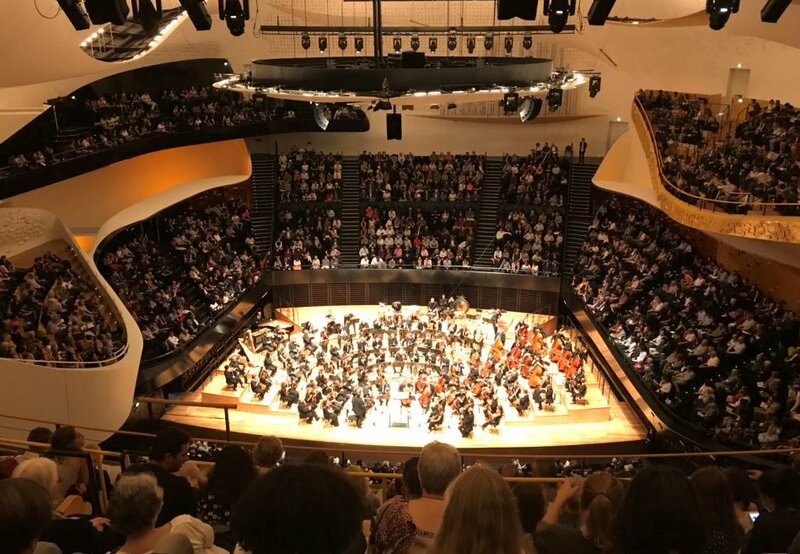 Indeed, fortunate audiences on five continents have had the opportunity to see and hear this “perilously seductive” score — as one music critic from BBC Music Magazine described it recently. The partial listing of public performances below attests to the piece’s widespread reach over the past 70 years. 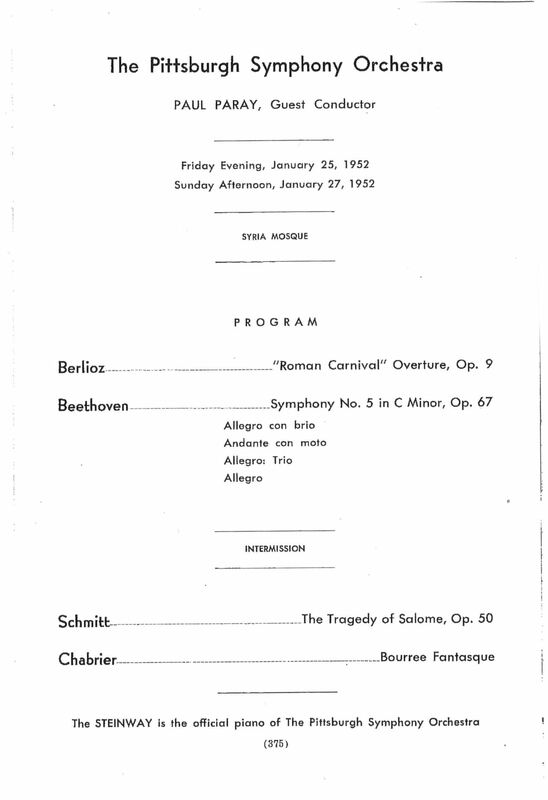 In good company: Paul Paray’s 1952 Pittsburgh Symphony performances of Salomé also featured the music of Beethoven, Berlioz and Chabrier. The program cover for the Coblenz Ballet’s staging of Florent Schmitt’s La Tragédie de Salomé in 1994/95. 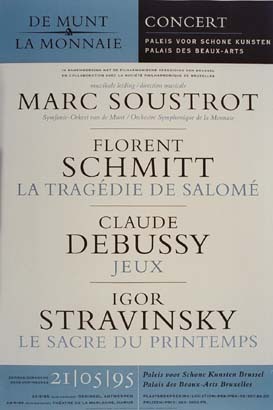 Brilliant orchestration in the Rimsky-Korsakov tradition: Florent Schmitt’s Salomé. 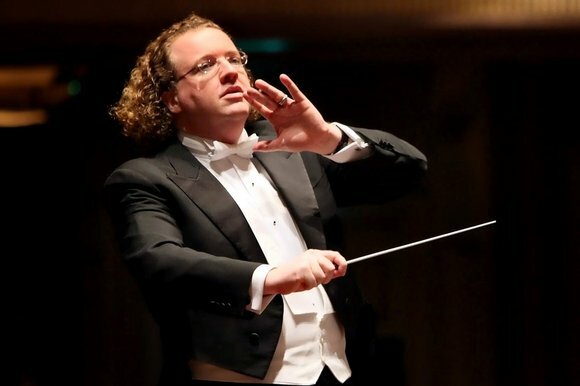 Passionate advocate: French conductor Stéphane Denève (2004, 2005, 2006, 2011, 2014, 2016, 2017). A beloved repertoire staple: French conductor Lionel Bringuier (2009, 2015, 2017, 2020). 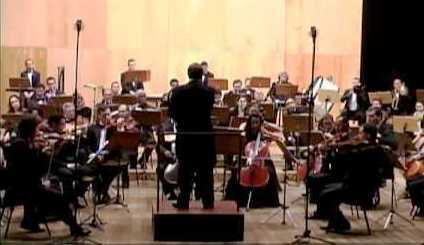 Ira Levin conducts Brasilia’s Claudio Santoro Orchestra in South American performances of Florent Schmitt’s La Tragédie de Salomé (2009). Yannick Nézet-Séguin’s 2009 performance with the Orchestre Métropolitain was also recorded and released on the ATMA label. 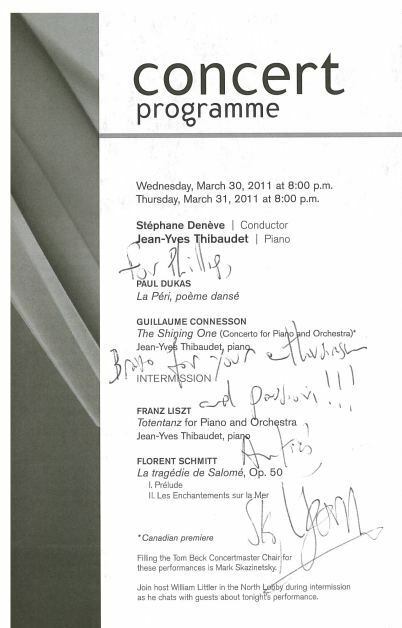 French conductor Stéphane Denève brought La Tragédie de Salomé to Canadian audiences in 2011 (Toronto Symphony Orchestra). 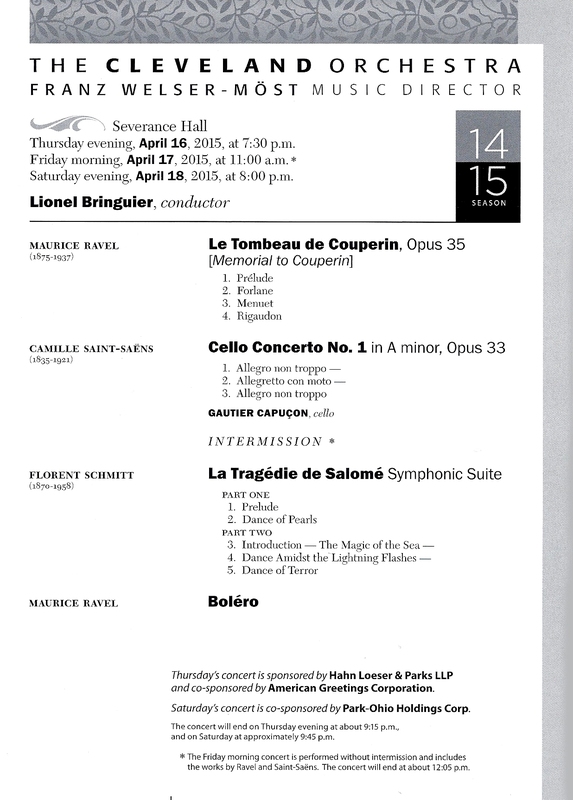 The Cleveland Orchestra’s concert program, conducted by Lionel Bringuier (April 2015). 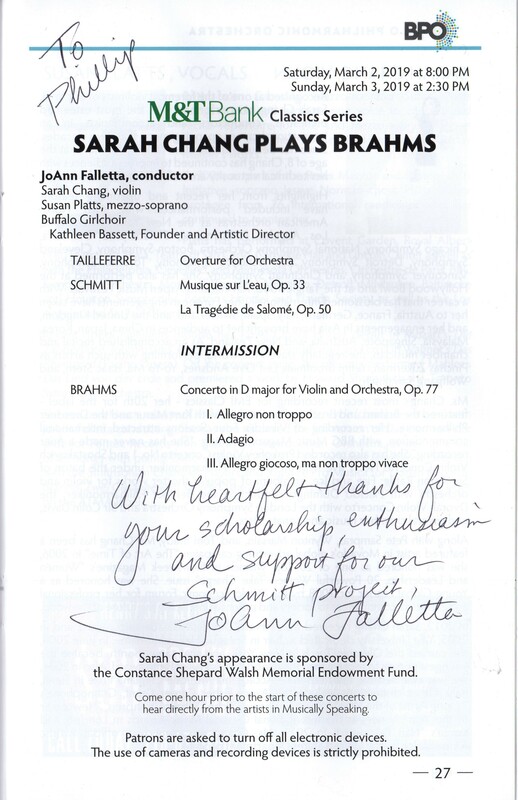 Maestro Bringuier’s performances of Schmitt’s composition were the first ones presented by The Cleveland Orchestra in more than 70 years. 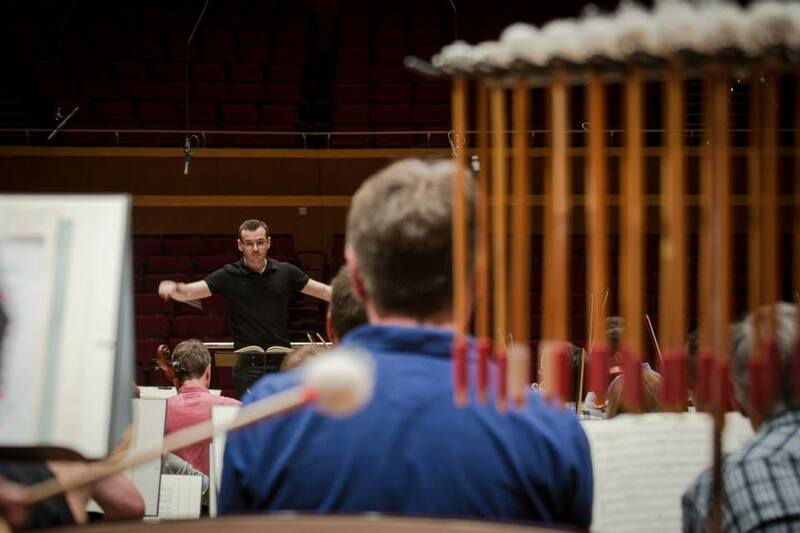 Maestro Lionel Bringuier rehearsing Florent Schmitt’s La Tragedie de Salome with the Bavarian Radio Symphony Orchestra (May 2015). 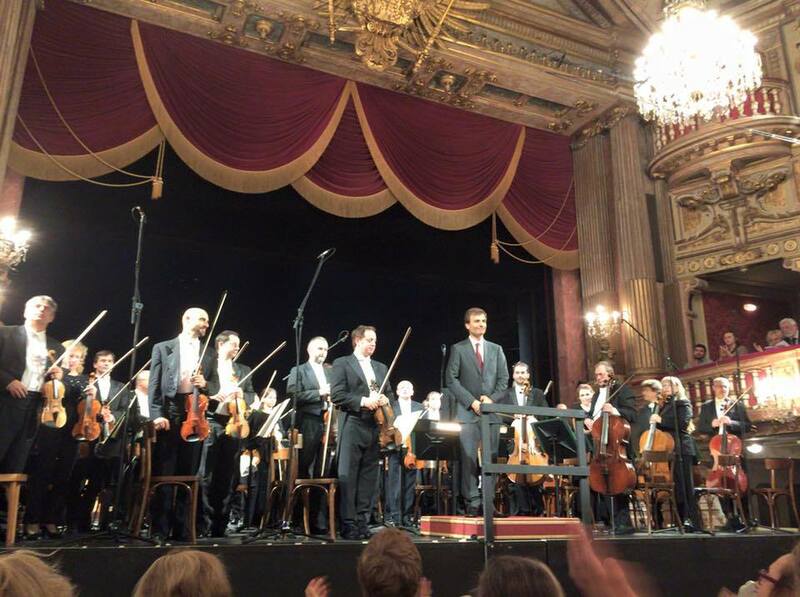 In 2015, the Slovak Philharmonic Orchestra under the direction of Miha Rogina performed La Tragédie de Salomé in the Schlosstheater Schönbrunn in Vienna — reportedly the first time the piece had been presented in Austria in decades. 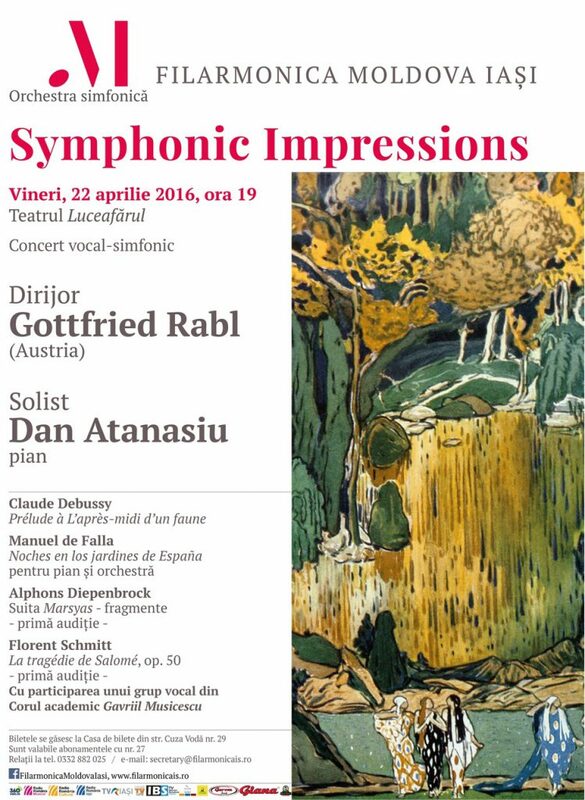 Austrian conductor Gottfried Rabl introduced Schmitt’s score to concert audiences in Romania — and keeps right on going with follow-up performances in that country (2014, 2016, 2018). 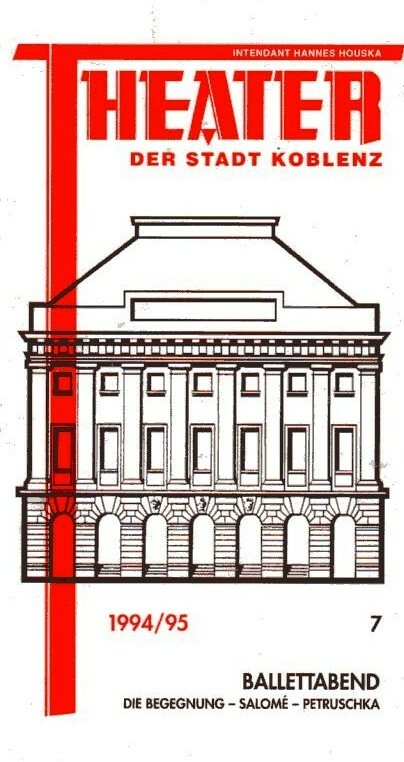 The Stuttgart State Orchestra’s performances of Florent Schmitt’s La Tragédie de Salomé were presented in April 2016. 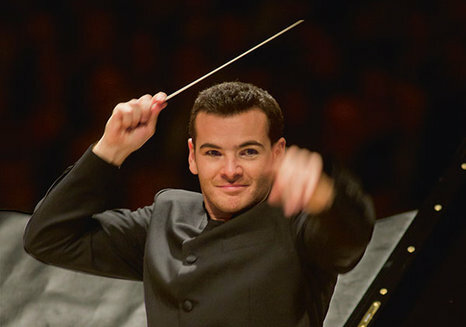 Sylvain Cambreling conducted. 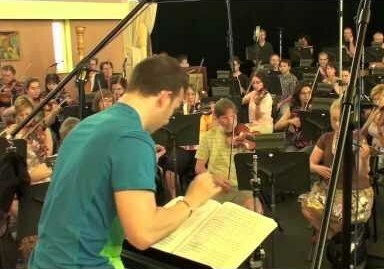 Conductor Stéphane Denève rehearses the Orchestre National de France in preparation for presenting Florent Schmitt’s La Tragédie de Salomé (September 2016). 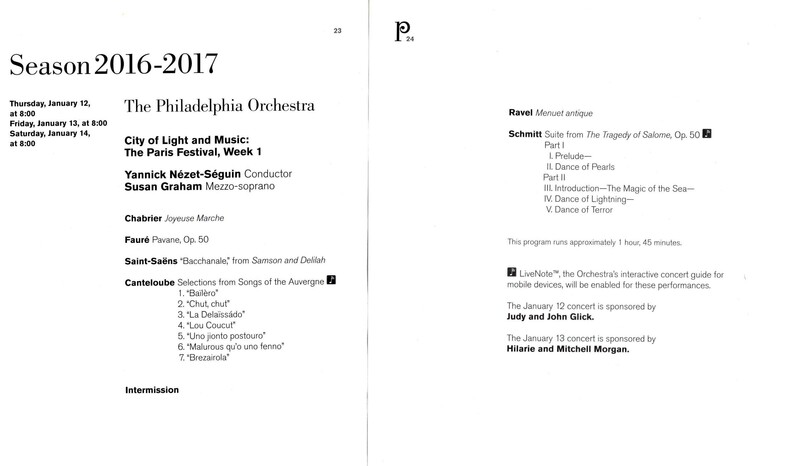 Yannick Nézet-Séguin and the Philadelphia Orchestra presented La Tragédie de Salomé as part of its Paris Festival series of concerts in January 2017. It was the first time the orchestra had performed Florent Schmitt’s score in nearly a century (1919). Conductor JoAnn Falletta rehearses the Buffalo Philharmonic Orchestra and Buffalo Girlchoir in preparation for presenting Florent Schmitt’s La Tragédie de Salomé (March 2019). 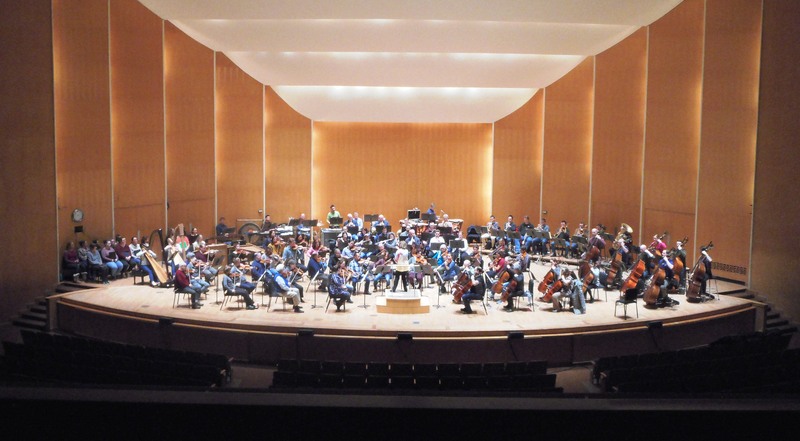 The March 2019 Buffalo Philharmonic concert program, featuring two compositions by Florent Schmitt in addition to works by Germaine Tailleferre and Johannes Brahms. 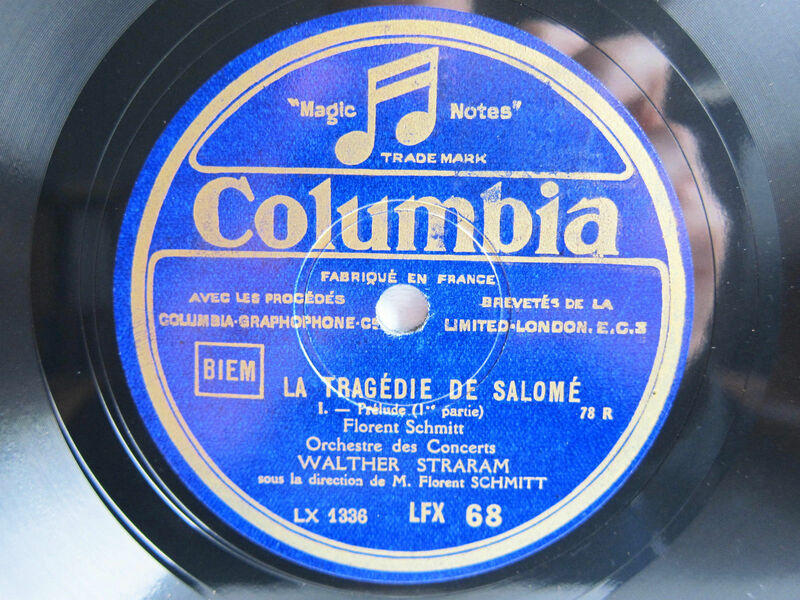 The second commercial recording of Florent Schmitt’s La Tragédie de Salomé, made in 1930, featured the composer as conductor, too. As Florent Schmitt’s most famous composition, it should come as no surprise that more than 15 recordings have been released of this music — either studio recordings or taken from live concert performances. This article provides details on each of those recordings. This entry was posted in Ballet, Classical Music, Composers, French Composers and tagged Ballet, Chandler Cudlipp, Classical Music, Composers, d'Indy, Deneve, Dukas, Florent Schmitt, Harold Lawrence, Istar, La Peri, Lionel Bringuier, Loie Fuller, Lycette Darsonval, Mariinsky Ballet, Music, Natalya Trouhanova, Paul Paray, Ravel, Salome, Schmitt, Stephane Deneve, Stravinsky, Theatre des Arts, Theatre Hebertot, Valses Nobles. Bookmark the permalink. « Get ready for Florent Schmitt’s piano duet and duo repertoire … all four CDs’ worth!